Lars Søndergaard Larsen was lost on 24 January 1942, when the Norwegian merchant MS Ringstad was torpedoed by a German U-boat. He had previously served in the Norwegian air force in Canada as a wireless operator. Lars Søndergaard Larsen was born on 12 July 1915 in Bedsted. He was the son of Jens Thomsen Lund Larsen and Kristine Larsen (née Bangsgaard). Having received a certificate as wireless operator in Svendborg on 1935, Larsen served as wireless operator in the merchant navy from July 1937 and onwards. In November 1939, Larsen was engaged in New York for service on the tanker MS Harry G. Seidel of the Panama Transport Company. The vessel was one of a series of tankers, which had originally been registred in Danzig and operated by the Baltisch-Amerikanische Petroleum-Import. In May 1935, following the rise of the Third Reich, Standard Oil transferred these vessels to the Panama register and the Panama Transport Company. For the time being, the vessels were manned by their German crews, but following the declaration of war, on 3 September, the company decided to remove German crew from all neutral vessels. Harry G. Seidel had arrived in Buenos Aires on 22 August manned with a German crew. On 13 November 1939, a Canadian crew and Danish officers took over the vessel. Danes replaced the Canadians on 7 January 1940, and the vessel were manned by Danes until she was sunk on 27 April 1942. Larsen was, thus, on-board Harry G. Seidel in the South Atlantic, when the German troops crossed the Danish borders on 9 April 1940. He transferred to another of the company’s tankers, MS Phoebus, which had been in a Hamburg dock undergoing repairs, when the war broke out. A Danish crew replaced the German crew the day before the vessel left Hamburg in October 1939. For the next two years, including during the period Larsen was on-board, the tanker made deliveries at North and South American discharge points and loaded at Caribbean and South American ports. Phoebus survived the war making fifty-two voyages from 1939-45. Larsen was discharged from the ship in June 1941. 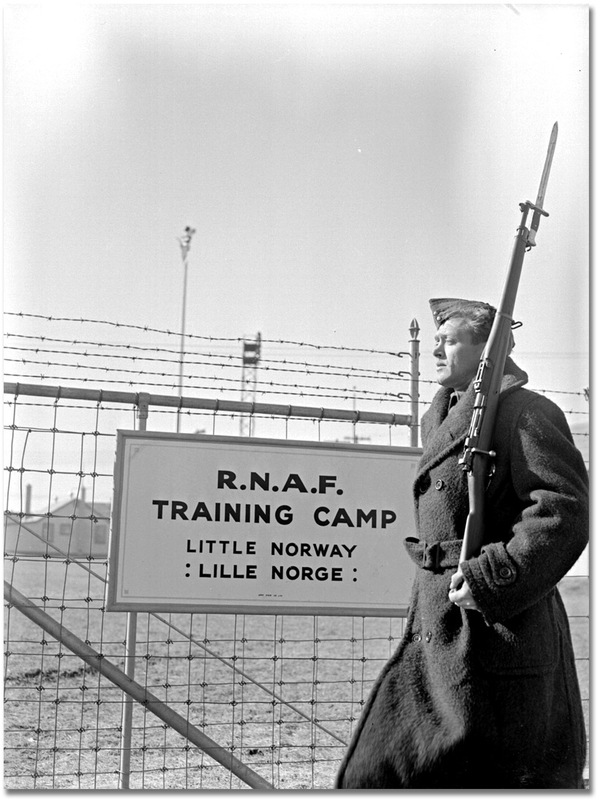 Little Norway, November 1940, Royal Norwegian Air Force training facility in Toronto, Canada (Archive of Ontario). Larsen volunteered for the Royal Norwegian Air Force in camp Little Noway in Toronto in June 1941. As it turned out, his air force service was short; only about five months. During this period, he followed a three months specialist course for wireless operators among other things. On 12 November 1941, he transferred to the Norwegian Merchant Navy, which was short of seamen at the time. He was signed on the Norwegian merchant MS Ringstad and sailed on convoys between Canada and England. On 31 December 1941, Larsen wrote the Recruiting Office, Danish Nationals, in London, to enquire about the possibilities to volunteer for one of the Danish units that were in the planning stages at the time. His ship was leaving Cardiff on 8 January 1942 according to the plan. Therefore, he was anxious to receive a reply from Captain Iversen before then. A second letter from the captain, mailed on the 16th, never reached Larsen. By then, he had been lost at sea. MS Ringstad left Cardiff on 8 January 1942 bound for St Johns in New Brunswick, Canada. The vessel became part of Convoy ON.54 in Belfast, leaving on the 13th. The convoy ran into a heavy storm near the meridian 16° west. The storm lasted for several days, and Ringstad had to stop the engines and drift to prevent the vessel from going down. The convoy came apart, and Ringstad continued on its own. On 24 January 1942 at 10.30 hrs.—at 45.50 N og 51.04 W—Ringstad was hit by a torpedo amidships on the starboard side. The ship sank in 20 minutes. The crew managed to get into three of the ship’s lifeboats, but with heavy winds and a rough sea, it was impossible to keep the lifeboats together. Map showing the approximate position of MS Ringstad, when she was torpedoed by U-333. © Mikkel Plannthin. Twenty minutes after the explosion the vessel sank. The witness only heard the one explosion and beyond this no shots were fired at the ship. Enquiry for the wireless operator was made from the witness's lifeboat to the nearest lifeboat, which was in charge of the chief officer, and received the reply that he was not there. Any enquiry about this to the third boat could not be made as that boat was too far away. Leif Meen, 2nd Officer, MS Ringstad. It is not clear if Larsen managed to get into one of the lifeboats, or if he went down with the ship. Larsen was one of twenty-seven seamen and three passengers, who were lost. Having drifted in the sea for five days, one of the lifeboats was rescued by the USS Swanson (DD-443) on the 29th. Thirteen survivors arrived in Reykjavik in Iceland on 5 February 1942 and were admitted to the Norwegian Hospital. Ringstad was sunk by the German U-boat U-333. This Type VIIC U-boat was commanded by Kapitänleutnant Peter-Erich Cremer, and had entered front-line service in the 3rd U-boat Flotilla based at La Pallice on 1 January 1942. DNA: Parish register, Bedsted parish. DNA: 10194, Det danske Råd, Rekrutteringskontoret, pk. 70. Mikkelsen, B. (2008). Danske rederier, pp. 25-30. Standard Oil Company (1946). Ships of the Esso fleet in World War II, pp. 207-9. Ancestry: New York Passenger Lists, 1820-1957. Ancestry: New York, Passenger and Crew Lists (including Castle Garden and Ellis Island), 1820-1957. M/S Ringstad - Krigsseilerregisteret, https://www.krigsseilerregisteret.no/en/forlis/221362/ (downloaded 6 January 2019). Wikipedia, Peter-Erich Cremer (downloaded 6 January 2019). Wikipedia, German submarine U-333 (downloaded 6 January 2019).